Iranian President Mahmoud Ahmadinejad blasted the United States at a UN conference for threatening to use nuclear arms, triggering a sharp American response and a walkout by several delegations. US Secretary of State Hillary Clinton dismissed the Iranian leader's charges as "wild accusations" in her speech to the opening session of the three-week review conference of the nuclear Non-Proliferation Treaty (NPT). Ahmadinejad said having nuclear weapons was "disgusting and shameful, and even more shameful is the threat to use, or to use, such weapons." "Regrettably, the government of the United States has not only used nuclear weapons but also continues to threaten to use such weapons against other countries, including Iran," he said. Iran President Mahmoud Ahmadinejad speaks to the 2010 High-level Review Conference of the Parties to the Treaty on the Non-Proliferation of Nuclear Weapons at the United Nations In New York. 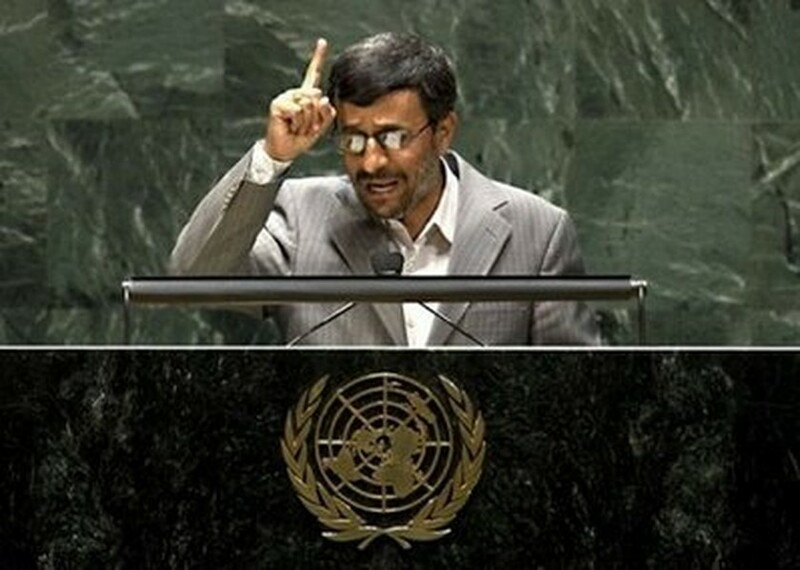 Ahmadinejad also hinted that Israel and an unnamed European country had made nuclear threats. His attacks against the United States and its allies triggered the walkout. Delegates from the United States, Britain, France and several non-nuclear weapons states left the assembly hall. Clinton insisted that US President Barack Obama "has made reducing the threat posed by nuclear weapons and materials a central mission of our foreign policy." In Washington, the Defense Department on Monday released previously classified statistics on the size of the US nuclear arsenal, saying it has over 5,000 warheads stockpiled. This is part of a US drive to prove it is serious about disarmament and transparent about its nuclear weapons. Washington has launched various initiatives recently to give weight to Obama's vow made in Prague a year ago to work for a world free of nuclear weapons. But in a new nuclear policy unveiled last month, it stated that atomic weapons were still part of its defense posture and that it reserved the right to use them against non-nuclear-weapons states, like Iran, which fail to comply with the NPT. It did not threaten any attacks. The Iranian nuclear crisis is seen as a key right of passage for the 40-year-old treaty which is credited with keeping the lid on nuclear proliferation worldwide. Eight nations have the bomb instead of the larger numbers feared in 1970 when the treaty was signed. Israel is also believed to have nuclear weapons. Iran is a test case, as its getting nuclear weapons could set off an atomic arms race in the Middle East. The NPT review is an attempt to tighten up the non-proliferation regime, which involves monitoring national nuclear programs as well as promoting both disarmament and the peaceful use of atomic energy. But even the United States has played down expectations for concrete results. -- amending the NPT to impose penalties on states, such as North Korea, which withdraw from the treaty. -- making tougher verification of nuclear programs by the UN International Atomic Energy Agency applicable to all countries. In fact, the some 150 nations gathered here may not even be able to agree on a final document, as this must be by consensus. The problem is the divide and mistrust between the nuclear haves and have-nots. Ahmadinejad took up this theme when he accused nuclear states of using the NPT to keep weapons and key atomic technology for themselves. But Clinton named Iran as the "only country" currently not in compliance with NPT obligations. She said this was why Iran "is facing increasing isolation and pressure" from the international community. She said Iran will not "succeed in its efforts to divert and divide" at the NPT conference. Iran is under three rounds of UN Security Council sanctions to get it to stop enriching uranium, which can be used to make the bomb, even though it insists its nuclear program is a peaceful effort to generate electricity. Faced with Tehran's nuclear defiance, the United States and five other major powers are trying to reach agreement on a fourth round. Another stumbling block at the conference is Egypt's insistence, backed by non-aligned states, that there be an international conference on creating a nuclear weapons-free zone in the Middle East. The 1995 review conference had called for such a zone. Review conferences are held every five years. Israel is not a member of the NPT. It says there must be peace in the Middle East before setting up a weapons-free zone. Clinton said the United States was ready to carry out "practical measures" towards such a zone. She did not say what these steps would be. She later told reporters that "conditions for such a zone do not exist" at the present time.